When it comes to wood flooring it is easy to expect a straight-laid plank look. However, with more options available this is not the case. Gone are the days of the traditional predictable rhythm especially when it comes to reclaimed wood. Not only does each piece of reclaimed wood have its own character, so does the configuration. With abstract dimensions a reclaimed wood floor will be far from uniform. In this blog, we go over some of the important reclaimed wood considerations that have been found by homeowners. It seems that roughly half of all flooring jobs today are reclaimed wood. This is because there are obviously thousands of reclaimed wood fans but when homeowners are looking at options most are choosing reclaimed wood. Not only because of its beauty homeowners love that it is eco-friendly. This often becomes the primary selling point. In addition, reclaimed wood fits in great with Colorado style and décor. Homeowners in Colorado are not only choosing reclaimed wood for the first homes, but for their mountain retreats as well. 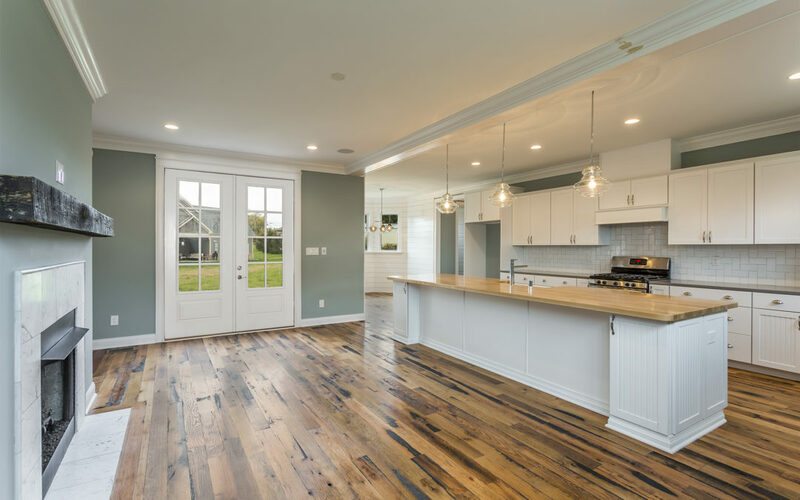 Contractors, designers, and homeowners have quickly learned that because reclaimed wood flooring is unique it comes with some special considerations. When you make the decision to install a reclaimed wood floor you want to make sure that it is authentic. Because of the demand and price point there are a lot of imposters out there. For example, a lot of individual people and shady companies are trying to pass of weathered lumber as reclaimed wood. Even though your reclaimed wood distributor may not know the complete history and origin of lumber they should have some general specifics. Although nothing with reclaimed wood is exact if you have the option to by end matched lumber then go for it. Unfortunately, most companies out there today are saying their reclaimed wood is end -matched but it is not. These words are constantly thrown around because end-matching has become a buzz word in the industry. Buying end matched reclaimed wood reduces the price because you do not have to account for so much waste. Looking for high milling standards is important when purchasing any lumber but especially with reclaimed wood. Since reclaimed wood is not manufactured or sanded down, good milling will prevent any severe lippages. When it comes to reclaimed wood flooring these are quite hazardous. One of the main concerns that homeowners have about using reclaimed wood is not knowing what the lumber has been exposed to. One of the biggest contaminants are pests. Since reclaimed wood has been exposed for decades all sorts of bugs have made it their home at one time or another. The kiln drying process will kill any species of insect that resides inside your reclaimed wood. Depending on your reclaimed wood project you will find other special considerations as time goes on. These are a few of the major items to contemplate early on! Colorado Custom Home Builders Love Reclaimed Wood! Reclaimed Wood In Kitchens | Is It Safe?